The Skink Gecko, which attains a length of 6 to 7 inches, is a member of one of the groups of ground geckos found in desert areas of central Asia. It digs shallow tunnel systems or hides under rocks, and the females lay their eggs in crevices. 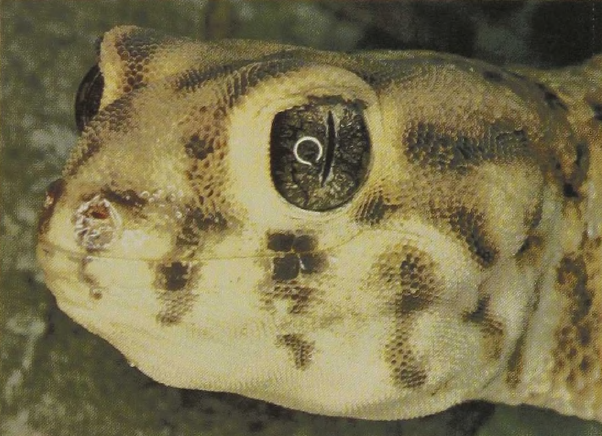 Most geckos have eyelids that are fused and transparent as do the snakes. Unlike snakes, they can protrude the large, flat tongue and wipe it over the outside of the eye, cleaning its surface. Ground geckos walk with the body high off the ground. Those of desert regions often have wide feet like snowshoes that float and stabilize them on the surface of the sand. The wide scales on the tail of the Skink Gecko have very tiny projections that rub against each other, producing a faint hissing sound when the tail is rapidly bent from side to side. Since these geckos can also squeak and make sounds by blowing air through the mouth, we do not know the function of the hissing tail. Does it attract the insects on which the gecko feeds?